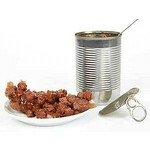 "Wet" Dog food has about half of the calories as Dry Dog food has. Because it easy Chew and swallow it is suitable for young puppies. A combination of dry and wet food is perfect and your pet has the advantages of both products. It is also an advantage for puppies, because they have more variety and therefore accept easier other food.